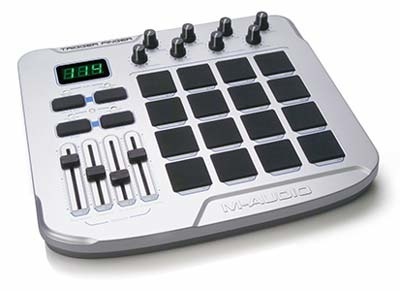 M Audio's new Trigger Finger USB controller features 16 velocity-sensitive pads, as well as eight knobs and four sliders, and looks ideal for triggering and programming drum samples, controlling software sequencers like Ableton Live or for anyone who never got that Akai MPC they wanted for Christmas! The pads and other controls can be freely assigned to any MIDI parameter and Trigger Finger also features pre-programmed control schemes for Live, Propellerhead Reason, M Audio iDrum and standard GM and XG drum kits. The Trigger Finger can store 16 control maps and comes with M Audio's free Enigma editor and librarian software. Trigger Finger is compatible with Windows XP and Mac OS X and can be powered by the USB buss or by an external mains adaptor. A MIDI out port means it can be used to trigger MIDI hardware as well. The unit will be out in March, priced £169. T M Audio +44 (0)1923 204010.